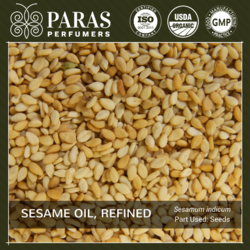 We offer natural and pure sesame organic oil that is extra light and chemical free. It can be easily absorbed by the body . It lubricates and tones your skin, muscles and joints; improves the blood circulation; helps in the removal of toxins from the blood and purifies it; elevates energy levels; helps calm the mind and nerves and sharpen the mind. We are highly renowned and reputed manufacturers of natural and pure Sesame Oil that is extra light and chemical free. Plus, it is developed from effective technology and can be easily absorbed by the body. Our products are developed in hygienic conditions and have the ability to lubricate and tone the skin, muscles and joints. We are highly acknowledged organization engaged in presenting a remarkable range of Sesame Oil. Blend of gingelly oil 80% & physically refined rice bran oil 20%. 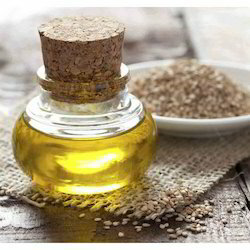 SESAME OILSesame Seed carrier oil is rich in vitamins B, E, and K and in minerals such as calcium, magnesium and phosphorus. Extraction Method:Cold pressed from sesame seeds.